On August 23, 2017, I received word that hospital-pharmacy icon and dear friend, Kenneth N. Barker, passed away earlier that morning. Below is a blog I wrote upon his retirement in 2009. I have made a few edits to bring it up to date. I’ve been thinking about my first lecture on pharmacy-automation, the life work of Dr. Kenneth N. Barker, and the autographed baseball I keep on my desk. Twenty-two years ago, I delivered my inaugural presentation on pharmacy automation at the American Society of Health-System Pharmacists 1995 Summer Meeting in the City of Brotherly Love. The room was packed. OK, it was a small room. But, hey, sometimes who’s there matters more than how many. At the time, fledgling PowerPoint didn’t pack enough power to support the number of images I felt compelled to show. So, I came armed with two carousels of slides to discuss the plethora of automated-dispensing cabinets and robotic systems available to hospitals. Halfway through the presentation, I mentioned that we needed to pause so I could change carousels. Sitting in the back row near the projector, a man stood and said, “I know how to do that.” Though we had never met, I recognized the esteemed Auburn pharmacy professor from pictures. I had heard about his landmark research and unrelenting passion to reduce medication errors. No less than Dr. Kenneth N. Barker swapped my trays. Without, I might add, dropping any slides or jamming the projector as I well could have. Is it trite to say that I was honored? He should have been giving the lecture. I was struck that a sage was willing to learn whatever he could from a newbie. At the end of the lecture, while others were politely applauding, the gentleman who changed my slides smiled and gave me a big “thumbs up.” Many similar gestures by Dr. Barker over the years provided wind my sails required for navigating to where I am today. On occasion, he read and even took the time to comment on my musings in these blogs. It was my privilege to interview the good doctor at the first unSUMMIT for Bedside Barcoding. We didn’t talk much about best practice models or his latest research. He humored me as we dipped into his childhood, discussed his journey, and chatted about his family, interests, and passions. We learned, for example, that he owned an Elvis suit. Ken’s career reminds me of a line from the Bible: “You do well to be angry—but don’t use your anger as fuel for revenge.” His meticulous research that uncovered unanticipated high rates of medication errors in our hospitals understandably provoked his wrath. But, still more, it stirred up brotherly love (his eyes welled up in tears as he talked about it) and fueled a lifelong commitment to reform pharmacy practice by identifying causes of errors, designing safer systems, and promoting best practices. Millions of people across our country and around the world have benefited by Ken’s anger channeled for their good. Thinking of Ken’s life work prompted me to do a bit of my own error research. I learned that the 1883 Philadelphia Phillies hold Major League Baseball’s record for errors committed by a team in a single season—639 to be exact. They also own the post-World War II record with 234 errors committed during the 1945 season. As for most individual errors in a single season, that record is held by Billy Shindle—you guessed it—a Phillie. His 119 bumbles in 1890 won’t get him a bronze statue next to Rocky Balboa’s in front of the Philadelphia Museum of Art. No city has that much love. Don’t even think about a plaque in Cooperstown. As for Dr. Barker, heaven alone knows how many errors have been avoided because of his unflagging efforts or how many lives and careers have been spared as a result. At the end of my interview, I made an unusual request. I asked Ken if he would be willing to sign a brand new official Major League baseball for me. With no disrespect to Ken, a lot of people own Elvis suits. 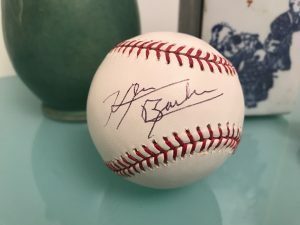 But I boast the distinction of being the only person in the world who has an official Major League baseball on his desk boasting Ken Barker autograph. As our brother leaves behind a hall-of-fame career, I’m standing in the back of the room with two thumbs up. Well done good and faithful pharmacist, mentor, husband, father, friend. You hit it out of the park. Enter the joy of your reward. 3 Responses to I’VE BEEN THINKING about my first lecture on pharmacy automation, the life work of Dr. Kenneth N. Barker, and the autographed baseball I keep on my desk. So sorry to hear of Dr. Barker’s passing. Mark, thank you for writing such a nice tribute. He hit a home run with his work in medication error identification and prevention! Heaven received an expert!